In small bowl, mix 1/3 cup sugar and the cinnamon until well blended. In medium microwavable bowl, microwave butter uncovered on High about 30 seconds or until melted. With pastry brush, brush melted butter on side and top edge of pie crust. Sprinkle buttered areas of crust with sugar mixture. Stir remaining sugar mixture and the chopped pecans into remaining melted butter until pecans are well coated. Sprinkle pecan mixture into crust-lined pie plate. Top with second crust; trim and flute edges. Prick top crust several times with fork. Bake about 20 minutes or until golden brown. Cool completely on cooling rack, about 30 minutes. In 1-quart saucepan, mix 1 cup of the blueberries, the lemon peel, lemon juice, tapioca and 2 tablespoons sugar. Using potato masher or fork, mash blueberry mixture well. Cook over medium-low heat about 15 minutes, stirring constantly, until thickened. Stir in remaining 2 cups blueberries. Spread lemon pie filling evenly over top of cooled pie. Pour blueberry mixture on top. Refrigerate until ready to serve. Garnish with lemon slices and pecan halves. Cover and refrigerate any remaining pie. Substitute chopped walnuts for chopped pecans, if desired. Garnish pie as pictured with a nest of lemon zest, if desired. 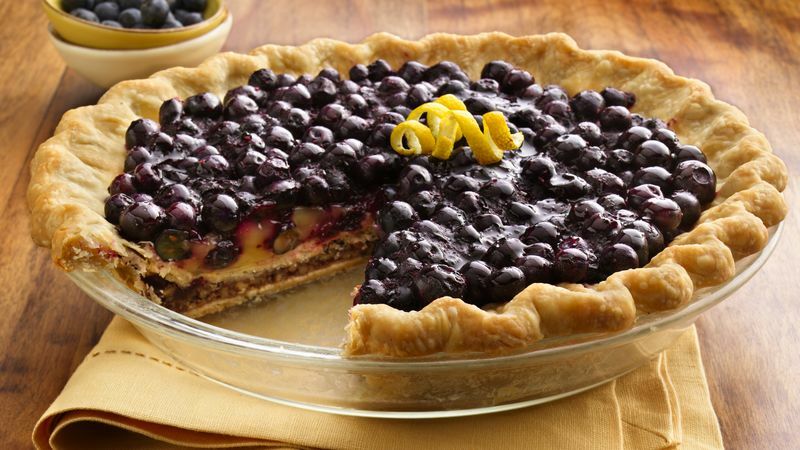 This was a winning pie from the Pillsbury® Refrigerated Pie Crust Championship in 2007. This recipe was submitted by Marina Heppner of Orchard Park, first place winner of America’s Fair--The Erie County Fair (NY).